Maximum RMS power of M80s? A. The loosely agreed-upon standard for measuring the power handling of a loudspeaker is five hours of modified pink noise without damage to the speaker. The basic problem with this test is it does not address the dynamic nature of music and movies. The instantaneous peaks of the dynamics are really what is going to determine when you run out of amplifier power and where the speaker will hit its limits. At Axiom, we conduct both tests using pink noise as well as dynamic tests to create the maximum amplifier power rating for each Axiom speaker. In the case of the M80s, they have been tested a minimum of five hours using modified pink noise at 400 watts rms power from the amplifier. Furthermore, they have been tested at this level for 100 hours using highly dynamic source material. We keep the ratings conservative, i.e. the tests are actually done at 600 watts for a 400-watt maximum power rating. In fact, the M80s have been tested up to 1200 watts without any problems. Many people think their speakers may be damaged if they connect them to amplifiers with power-output ratings that are far in excess of the speaker's stated limits, or that they should somehow "match" the speaker's maximum power rating to an amplifier. However, unless you truly abuse your speakers by running them at excessive levels where distortion becomes audible and grating, even small speakers can be used with little or no risk with quite large amplifiers. It is in fact small amplifiers driven beyond their dynamic capabilities (clipping) that cause the most damage to loudspeakers. You should also scrutinize the "sensitivity" rating of a speaker because this is a standard adhered to by most manufacturers. It tells you how loud a speaker can play for a given input signal level. The sensitivity rating is the sound pressure level (SPL) measured in decibels (dB), produced by the speaker at a distance of 1 meter, with 1 watt of input power. The M80 will produce 95 dB SPL (in room) and 91 dB SPL (anechoic) at 1 meter with 1 watt of input power. That is very loud sound, and because the M80 is this efficient, it can be driven to reasonable listening levels by a 10-watt amplifier. As speaker sensitivity goes, the M80s are at the high end of the scale. However, keep in mind that all of these SPL ratings are done at 1 meter and as you move farther away from the speaker, substantially more rms power will be required to achieve the 95-dB rating. In very large rooms, a lot of quality amplifer power is required just to achieve reasonable volume levels. More compact speakers like the M2 produce 91 dB SPL (in room) and 87 dB (anechoic) with 1 watt of amplifier power, so they actually need more, not less, amplifier power to produce comparable sound levels. It is important to be aware that loudspeaker acoustic output in decibels does not double each time you double the rms power of the amplifier. For instance, if a speaker requires 10 watts to produce a comfortable listening level from 12 feet away, doubling the amplifier power to 20 watts would only raise the speaker's sound level by 3 dB. Subjectively, 3 dB sounds "somewhat louder," but it's nowhere near "twice as loud." To achieve that would require ten times as much amplifier power, or 100 watts! So the old adage of buying as much power as you can reasonably afford still applies. Find out more about RMS power in "The Secrets of Amplifier Power Revealed"
Most people only ever see the outside of their loudspeakers, and that's probably a good thing! But if you've ever wondered what goes into building a loudspeaker, then this video will walk you through the inner workings of an M80 Floorstanding Speaker. Okay, I admit it's the skinniest video ever made! But you try to get these speakers in a frame with Axiom's Andrew Welker, who designed the Omnidirectional LFR1100s together with Ian Colquhoun. Angled Backs: What's Happening Behind the LFR1100? The Angled Back on the LFR Speaker Another thing has had my curiousity piqued about the LFR1100 omnidirectional speaker . Designing the LFR1100's Audio DSP: What Does That Thing Do, Anyway? I recently spent a lot of time with the new LFR1100 omnidirectional speakers, and something had me curious. Axiom's M22s in Walnut with a natural finish. Tyler Stripko of HomeTheaterHiFi has reviewed the M22s, and he was quite surprised by their performance! It has been a long time since I have had a sub-$1,000 per pair set of speakers in my home, let alone sub-$500 per pair ones, but I was incredibly impressed with the capabilities of the M22. 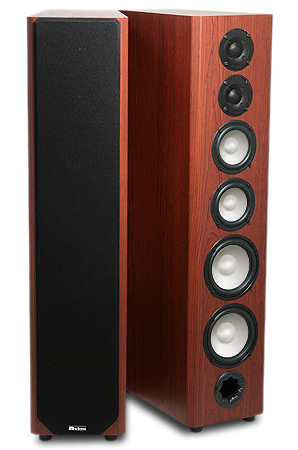 Vermont Maple M3 Bookshelf Speakers Home Theater Hi Fi Reviewer Greg Z has just finished his review of the Axiom M3 v3 Bookshelf Speakers in our Vermont Maple custom vinyl finish. Directional Speakers or Omnidirectional Speakers? Why Put Drivers On the Back of the New Speaker? I managed to find a quiet minute with Axiom Audio Engineer Andrew Welker at Montreal's Salon Son Et Image, and asked him to explain to me, in laywoman's terms, why he put drivers on the back of the speaker.